Representatives from Michelin, Unite and Dundee council discussed options for the site. 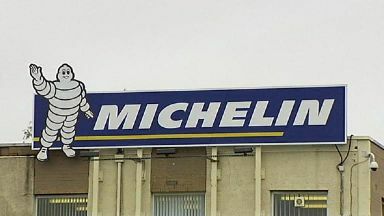 An action group established to try to save jobs at Dundee's closure-threatened Michelin tyre factory has met in the city. Economy Secretary Derek Mackay chaired the first gathering of the panel set up after the firm announced plans to cease production at the plant, which employs 845 people. Representatives from Michelin, Unite, Dundee City Council and Scottish Enterprise were among those discussing options for the site, which include repurposing the factory. Scottish Secretary David Mundell attended on behalf of the UK Government. Mr Mackay, who has previously held talks with senior executives at the French firm, said he hopes to present the best possible proposition when he meets them again in around three weeks. He said: "The group is exploring a range of options recognising that we want to retain the site. "We want to retain the presence of Michelin in Dundee but we are looking at research and development, manufacturing, circular economy - a range of possibilities to put the best possible proposition to Michelin. "We'll have to work intensively to build that proposition." He added: "I see the challenge ahead - it's a monumental challenge but I'm absolutely focused on it and I'll leave no stone unturned to try to find the solutions to present to Michelin to ensure they have a continuing presence in Dundee and protect the workforce at all costs." "I'll leave no stone unturned to try to find the solutions to present to Michelin to ensure they have a continuing presence in Dundee." Michelin said the market for premium smaller tyres such as those produced at the Tayside plant has dropped significantly due to an increase in cheap imports from Asia and a shift to larger car tyres. The factory, which opened in 1972, is said to be the largest industrial employer in Dundee. Council leader John Alexander said the meeting was productive but the group was no under illusions about the task ahead. He said: "Michelin has been quite clear about the rationale behind its decision, around market conditions, which is something we can't influence. "What we can influence is what the future of the plant potentially looks like. "We've got a body of work to go through in the next week before we meet again. "There will be a whole series of conversations taking place in the intervening week looking at scaling up the proposition." Mr Mundell said following the meeting: "What we want to do is put forward the strongest possible case. "I think everybody is realistic, not least the workforce, about the challenges of doing that, but we've got a window of opportunity over the next three weeks and we've got to take it. "The UK Government will work closely with the Scottish Government, with the council and the other stakeholders around the table in shaping a proposition. "It's very much about putting the ball into [Michelin's] court, about coming up with the most credible and persuasive case possible, and we want to play our part in ensuring that's done."